This hanging store sign is a rare antique. The sign is black and rectangular with a domed top. 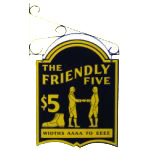 The name “The Friendly Five” is printed at the top of the sign. Below is a large “$5”, a shoe, and an image of two gentlemen shaking hands. All lettering and images are in yellow.